Stacked, grilled, shredded, layered, slow-cooked and served with pride. There are so many delicious sandwich options in Clinton County, Dagwood would be dancing with joy. Here are five popular picks. When it’s burger time we’re heading to Wally’s Drive-In, a choice for generations of diners. Nothing fancy here, just good fresh ground beef cooked right, with a little cheese if you want it. It’s a classic. A side of onion rings and a chocolate shake make it a perfect to-go meal. Open daily, 10:30 a.m. – 7:30 p.m. The sandwiches at A Fine Swine are slow-cooked and so-so good. One of the finest picks is the Albert Einswine, a two-handed beauty with tender pulled pork topped with a juicy sausage and one of the house-made sauces. Keep the napkins handy. Monday – Saturday, 11:00 a.m. – 8:00 p.m.
Sunday, 11:00 a.m. – 6:30 p.m. Whether it’s Friday in Lent or you’re just hankering for a fish sandwich, head to Dairy King in Breese or Trenton. Their Cod Tail Sandwich is a winner, lightly breaded and fried and served with homemade tartar sauce. Do like the locals and have it with the fresh-cut fries and a Ski soda. Monday – Friday, 7:00 a.m. – 9:30 p.m.; Saturday, 8:00 a.m. – 9:30 p.m.; Sunday, 9:00 a.m. – 9:30 p.m.
Open daily 10:00 a.m. – 9:30 p.m.
Layers of goodness go into the sandwiches at Covered in Chocolate. The venue has a knack for combining tasty flavors. One satisfying example: the Balsamic Chicken Sandwich, a super stack of chicken, avocado, bacon, heritage blend, feta, red onion and drizzle of balsamic vinegar. If you can pass up dessert here, you have more self-control than we do! 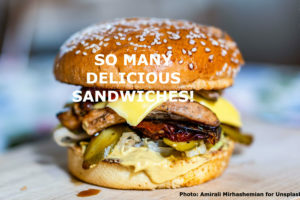 Wednesday – Friday, 8:00 a.m. – 4:00 p.m.
New kid on the block, Duey’s On Fairfax, is quickly becoming a go-to for its wide range of specialty sandwiches. Named for the chef’s grandmother, the Chi-Town Nana is everything you expect a great Windy City sub to be: ham, pepperoni and salami on a toasted French roll; topped with shredded lettuce and tomato, an Italian vinaigrette, and roasted red pepper spread. Here’s to Grandma! Wednesday – Saturday, 11:00 a.m. – 8:00 p.m.
Sunday, 11:00 a.m. – 7:00 p.m.
Do you have a favorite sandwich that wasn’t mentioned? Let us know. There’s always more to enjoy in Clinton County! This entry was posted in Food & Drink, Local Businesses and tagged Clinton County, Clinton County business, Clinton County dining, Clinton County restaurants, Clinton County tourism by admin. Bookmark the permalink.